First of Dhu al-Qi’dah; birth anniversary of Lady al-Ma’soomah (peace be upon her). The first day of the month of Dhu Al-Qi'dah in the year 173 AH, was the blessed day of the birth of the flourishing bud of the blessed prophetic tree, Lady Fatima daughter of Imam Musa al-Kadhem son of Imam Ja'far as-Sadeq (peace be upon them all) known as "al-Ma'soomah [the Infallible]", and the house of the revelation and the message bloomed with the birth of this new born which was named by her grandfather as-Sadeq (peace be upon him) by "Karimat [the noble one] Ahl Al-Bayt (peace be upon them)." Lady al-Ma'soomah (peace be upon her) was brought up in a very noble family. She was the daughter of the Holy Imam Musa al-Kadhem, the sister of the Holy Imam Ali ar-Reda, and the aunt of the Holy Imam Mohammed Al-Jawad (peace be upon them all). She was taught all the Islamic sciences by her father and brother (peace be upon them) and she transmitted Ahadith (narrations) from them. She became famous as 'Aalimah (the Learned Lady) and Muhaddithah (the Learned Lady who transmitted Ahadith), she (peace be upon her) was most pious, noble and reverend lady. Because Harun al-Abbasi had put her father in prison since her birth, and had assassinated him by poison in 183 AH. Lady Al-Ma'soomah has grown up with her brothers and sisters under the auspices and care of her brother imam Ar-Reda (peace be upon him) who gave her the title of "Ma'soomah." Although the separation from her father had been very difficult, Lady Fatima Ma'soomah (peace be upon her) still had her brother to comfort her. However, in 200 A.H, Ma’mūn (the 7th Abbasid Caliph), demanded Imam ar-Reda’s (peace be upon him) presence in Khorasan. The Imam (peace be upon him) was forced to accept this invitation and he went to Khorasan. The departure of her brother further increased her sorrow especially that he told her that he will be martyred in Tus. So she decided to follow him. Lady al-Ma'soomah (peace be upon him) accompanied by her brothers left Medina for Khorasan to meet her elder brother Imam ar-Reda (peace be upon him). On their way, they were welcomed and greeted by the people of the different cities and villages. Lady al-Ma'soomah (peace be upon her) like her noble aunt Lady Zaynab (peace be upon him) delivered the message of innocence of her brother Imam ar-Reda (peace be upon him) and revealed the evil intentions of the Abbasid caliph to the public. When they reached Sawah, they were attacked by the Abbasid army and many of her brothers were mercilessly martyred. And, according to some historical reports Lady Al-Ma'soomah (peace be upon her) during her stay in Sawah was poisoned by a lady servant on the orders of the Abbasid commander. Lady al-Ma'soomah (peace be upon her) became severely ill and in this condition, she migrated to Qom where she was warmly welcomed by the Shias of the city. Musa bin Khajraj, the doyen of Ashari family in Qom took the rein of the she-camel litter in his hand in which Lady al-Ma'soomah (peace be upon her) was travelling and large number of people gathered around the she-camel litter. 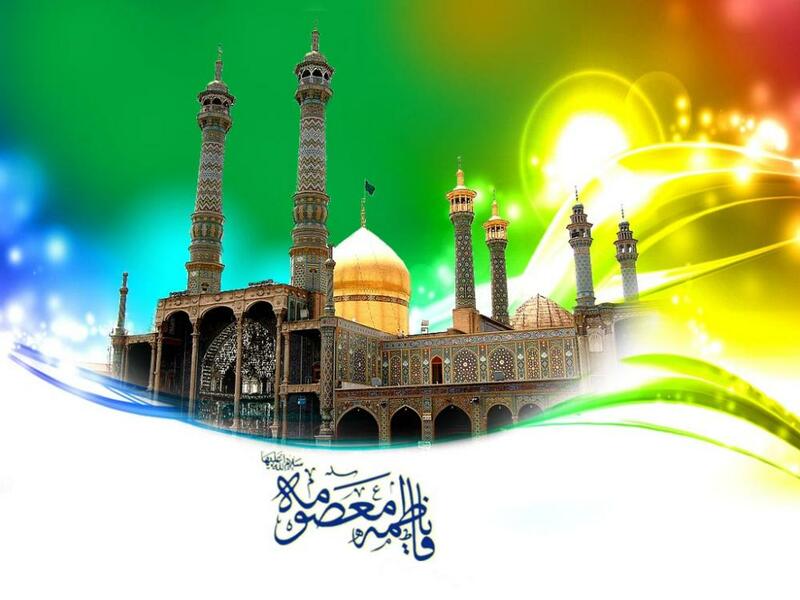 Lady al-Ma'soomah (peace be upon her) entered the city of Qom on 23rd Rabi al-Awwal, in the year 201 A.H. The effect of poisoning increased during her short stay of 17 days in Qom and she attained martyrdom on 10th of Rabi al-Thani 201 A.H. When the grave was ready there arose a difference that who should keep the body of Lady al-Ma'soomah (peace be upon her) in the grave. It is reported that suddenly two men whose face were covered and riding the horses came to that place and performed the Salaat-e Mayyit (the prayers for the dead person) and then one of them went in the grave and the other person gave the body of Lady al-Ma'soomah (peace be upon her) to that standing person in the grave who laid her to rest in the grave. After the burial of Lady al-Ma'soomah (peace be upon her), Musa bin Khajraj built a shed over the grave made out of mat. In the year 256 A.H., Lady Zaynab (peace be upon him), the daughter of Imam Mohammed Al-Jawad (peace be upon him) constructed a dome over the grave of her aunt Lady al-Ma'soomah (peace be upon her). Since the burial of that divine lady of Islam in Qom, the holy grave of her have become a centre of Ziyarat for the lovers of the Holy Ahl Al-Bayt (peace be upon them). Imam Al-Jawad (peace be upon him) said: "Whoever performs the Ziyarat of my aunt [Fatima al-Ma'soomah (peace be upon her)] in Qom will enter paradise". Imam as-Sadeq (peace be upon him) said: "Mecca is God's sanctuary, Medina is Prophet Muhammad's (Prayers and Allah's peace be upon him and his holy household), Kufa is Imam Ali's (peace be upon him), and Qom will be the sanctuary for one of my descendants; her name shall be Fatima. Whosoever visits her sanctuary will be rewarded a heavenly paradise." and "By the intercession of Fatima al-Ma'soomah (peace be upon her) all my Shias will enter the paradise". Imam ar-Reda (peace be upon him) also said: "Her visitors shall be endowed with paradise" and "Whosoever visits the sanctuary of Fatimah, will be rewarded a heavenly paradise" and "Whoever performs the Ziyarat of Fatima al-Ma'soomah with the knowledge of her status will attain paradise".